For the present day quarter in Istanbul, see Karaköy. For the hill in Romania, see Seven hills of Iași. Galata (in Greek was known as Galatas (Γαλατᾶς, Galatás)) was a neighbourhood opposite Constantinople (today's Istanbul, Turkey), located at the northern shore of the Golden Horn, the inlet which separates it from the historic peninsula of old Constantinople. The Golden Horn is crossed by several bridges, most notably the Galata Bridge. The medieval citadel of Galata was a colony of the Republic of Genoa between 1273 and 1453. The famous Galata Tower was built by the Genoese in 1348 at the northernmost and highest point of the citadel. At present, Galata is a quarter within the borough of Beyoğlu (Pera) in Istanbul, and is known as Karaköy. 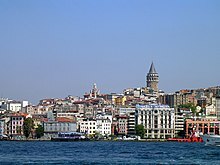 There are several theories concerning the origin of the name Galata. The Greeks believe that the name comes either from Galatai (meaning "Gauls"), as the Celtic tribe of Gauls (Galatians) were thought to have camped here during the Hellenistic period before settling into Galatia in central Anatolia; or from galatas (meaning "milkman"), as the area was used by shepherds for grazing in the Early Medieval (Byzantine) period. Italians believe the name comes from calata meaning slope or descent, because Galata, which is a former Genoese colony, is located on a hill that descends to the Bosphorus. Galata has subsequently been re-adopted by the city of Genoa in the naming of its naval museum Galata Museo del Mare. When Constantinople fell to Mehmed the Conqueror in 1453, the neighborhood was mostly inhabited by Genoese and Venetian Catholics, though some there was also some Greek, Armenian and Jewish residents. The Christian residents of Galata maintained a formal neutrality during the Ottoman siege, neither siding with the Sultan, nor openly against him. One modern historian, Halil İnalcık, has estimated (based on the a census from 1455) that around 8% of Galata's population fled after the city fell. 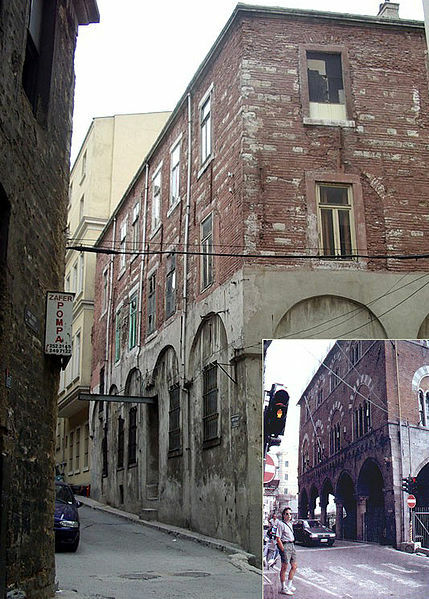 In the 1455 census it is recorded that Jews primarily resided in the Fabya quarter and Samona (which is in the vicinity of present day Karaköy). Though the Greek speaking Jews of Galata appear to have retained their homes after the conquest, there are no Jewish households recorded in Galata by 1472, a situation that remained unchanged until the mid 16th century. "Those of them who did not manage to board their ships before the Turkish vessels reached their side of the harbor were captured; mothers were taken and their children left, or the reverse, as the case might be; and many were overcome by the sea and drowned in it. Jewels were scattered about, and they preyed on one another without pity." According to Ducas and Michael Critobulus the population was not harmed by Zaganos Pasha's forces, but Chalkokondyles does not mention this good conduct, and Leonard of Chios says the population acted against orders from Genoa when they agreed to accept servitude for their lives and property to be spared. Those who fled had their property confiscated but, according to Ducas and Lomellino, their property was restored if they returned within three months. ^ User, Super. "History". www.adahanistanbul.com. Retrieved 2017-07-09. ^ "The Best Galata Museo del Mare Tours, Trips & Tickets - Genoa | Viator". m.viator.com. Retrieved 2017-07-09. ^ Rozen, Minna (2010). A History of the Jewish Community in Istanbul:The Formative Years, 1453-1566. Brill. p. 12-15. ^ Rozen, Minna (2010). A History of the Jewish Community in Istanbul:The Formative Years, 1453-1566. Brill. p. 15. ^ Rozen, Minna (2010). A History of the Jewish Community in Istanbul:The Formative Years, 1453-1566. Brill. p. 13. ^ Rozen, Minna (2010). A History of the Jewish Community in Istanbul:The Formative Years, 1453-1566. Brill. p. 14-15.